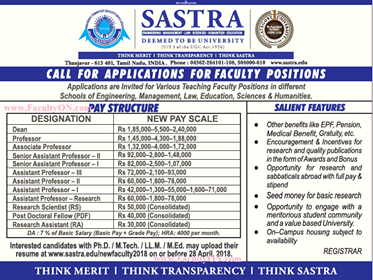 Sastra University, Thanjavur has advertised in THE TIMES OF INDIA newspaper for the recruitment of Professor/Associate Professor/Assistant Professor job vacancies. Interested and eligible job aspirants are requested to apply with in 28th April 2018. Check out further more details below. About College: SASTRA, Deemed University, top university, Tanjore, B.Tech, B.E, Thanjavur, A grade, M.tech, Law, ECE, EEE, EIE, Mech, Civil, Biotech, Biot, Chemical, MBA, Computer science, IT, Management, education.